I’ve written before about how much I enjoy signs. Especially those that show up around businesses in full view of customers. Some of the best signs turn up at fast food joints that are typically staffed by a young crew of creative kids who can’t wait around for the corporate offices to make them a sign. So they take matters into their own hands and and create some of the best unintentional humor around. It’s like a dinner play at a fraction of the cost. 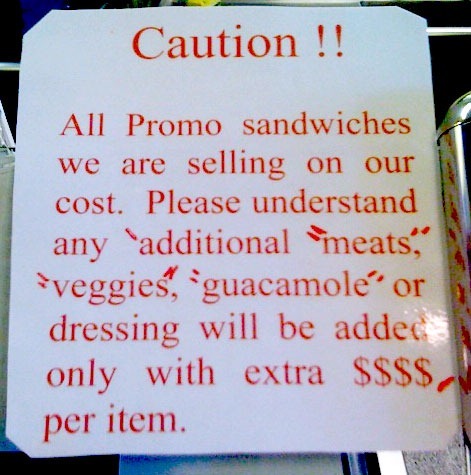 I’m not sure “Caution” is the best choice when you’re in the sandwich business. Plenty of businesses sell items at cost, but make it up in other areas. Maybe there’s big profits in selling extra “guacamole”. I don’t know, but I love the use of quotation marks. One more thing – wouldn’t one $ sign do? When I see $$$$ I think of Zagat reviews. By that scale a few extra tomatoes may run 50 bucks. I’m only used to paying for refills at Chinese and Thai restaurants. I don’t know what it is about those two, but it’s not uncommon for a glass of ice and a can of Diet Coke to arrive at our table. Maybe they don’t believe in the concept of fountain drinks, but I’ve adjusted my lifestyle to deal with it. But I’m not accustomed to paying extra for fountain drinks at fast food places on top of inflated prices. Especially those with self-serve stations. I finished my Diet Pepsi and slowly nudged my way back over to the cooler where I filled my cup with ice. The two Quizno’s employees gave me the stare-down assuming I was about to fill my cup with an extra 99 cents worth of refreshment. As I stood at the counter ready to pay for my meal, I noticed the obligatory tip jar. I paid for one sandwich and three kid’s meals. The kids wanted chips so the cashier reached into each bag and pulled out the chocolate chip cookie right in front of the kids. I guess you get one or the other when business is tight. How many of you would still leave a tip a this point? 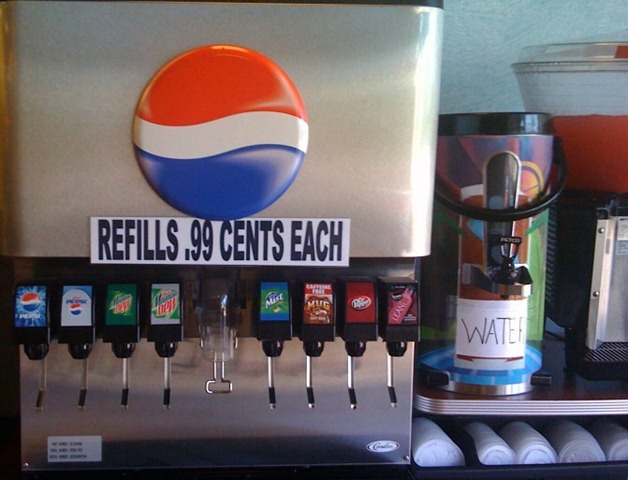 Since it cost them pennies to provide soda, the 99 cents for refills is pretty brassy and endears customers to return, huh? That is so funny. I think tip jars at fast food places are ridiculous. They’re already getting paid for their job. They’re not waiting on me. They’re not servicing me any more than what they’re getting paid for. Maybe I”m just old fashioned. Ooh. “Brassy”. I like that word. It has been a while since I learned my math punctuation, but isn’t .99 cents less than 1 cent? Maybe you could give them a penny for the refill and they can keep the extra 0.01 cent for a tip. I think this deserves a call to the Quizno’s customer service hotline. I think these gems are one of my favorite parts of reading your blog. I have not idea why I never see signs like these. Either I am missing it or you live somewhere special :).